Posted by Sumgyeojin Gem on May 26, 2014. I interviewed Joo before about her street food business, KORRITO. KORRITO is known for their burritos, using Korean ingredients in a modern twist that suit both East and West, traditional and modern elements. A wonderful taste of ‘home’ with wholeful of excitement in either in burrito wrap or served in meal box. KORRITO has become popular one of the popular Korean street foods in London. The new documentary, “Savouring Korea – The Taste of Home”, was launched last month and it slowly become known across the world through the power of social media and word-of-mouth. You can check out some of the articles that I have covered for KORRITO (food review and interview) and documentary. This time, I had a chat with Joo, the founder of KORRITO, through Skype where she talks about her passion for Korean food, her experiences in making the documentary, and KORRITO. Could you talk about how you discovered Korean food and KORRITO? Being Korean but growing up in the UK, there was so much to discover about Korean food. To me, it was almost second nature despite being in London. It became a big part of my life- food, Korea, and its culture. When you are away from your homeland, your desire to stay connected becomes stronger and growing up, I did this through food. Then, in my adulthood, I’ve been given the opportunity to help promote Korean food through KORRITO, my street food business. Our inspiration comes from across the pond in LA, where Korean food is hugely popular. It’s a place where Korean flavours are merging with others creating truly beautiful flavours. How did the documentary and its three episodes come about? Why did you decide to do it? Before we launched KORRITO as a food business, the documentary project was already well-established through our Kickstarter campaign. I wanted my business to not just be about selling food, but really to help raise awareness of Korean food in the UK. I grew up passionate and learning about Korean food but I was seeing the lack of knowledge around me and even amongst my friends who would try it for the first time when they came to visit me. Through their positive reactions, I knew Korean food could really take off. 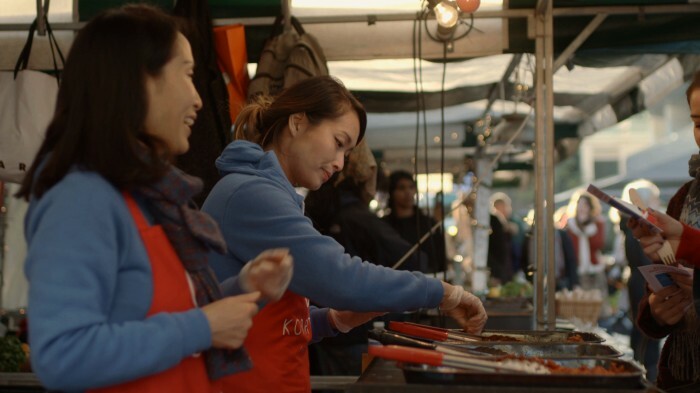 The focus of the documentary really is to help bring Korean food to the global stage. I knew that the focus would have to be on making it as accessible as possible. Going through online distribution channels where people like and share content is the way to do it. No one really seems to watch TV anymore! So I took that approach to make the project available online. Each episode is under ten minutes long, they can be viewed through mobile, easily shared and liked. That way it is more accessible to watch them. When you visit Korea, were there any cultural shocks and experiences that you and your team had encountered? There wasn’t anything particularly shocking. The Cinematographer and Director, Adam Hobbs had been living in Korea for a few years already and the rest of the team were also either Korean or living in Korea. So, rather than being shocked, we developed a deeper appreciation on the things we captured through film. We had a real feeling of respect. Even though Adam had been living in Korea, I don’t think he’d had the chance to explore Korean food and culture with the kind of insight we got from meeting the people we interviewed. For example, we filmed at the restaurant Youngsusan for hours. The staff and Mr. No Soo Kim were incredibly kind. They brought out six or seven courses. We couldn’t feature all of them in the documentary but the way they aligned with Korean history in forms of royal cuisine, it was so inspiring. There were a lot of stories and history steeped in the food itself. For example the dish ‘Tangpyungchae’ presents two different flavours that can be eaten separately but also blended together for a union of flavours. We were taught that the King would present this dish to his court officials during times of conflict and say, “Don’t fight. Look at this dish, two very different flavours can be combined and come together in unison.” I found this ethos behind the food really inspiring. How were the experiences when you went to the countryside in making the true essence of Korean food? Up until now, I’d never had the opportunity to explore the countryside. Whenever I visited Korea, I was always in busy cities. People mainly associate Korea with the city, with blinding neon lights and cellphones toting teenagers. Korea has advanced so quickly that it’s easy for people to neglect their agricultural history and Korea’s countryside. I realised that we need to appreciate rural Korea. You need to stop to wonder how truly beautiful and serene Korea is. We often refer to it as “Land of the Morning Calm” and this describes the countryside perfectly. It was an amazing experience to go and meet Mrs Kim at the ‘Gochujang’ farm. She abandoned her city life to devote herself to the countryside. She told me that even busy city people are still clinging to the rural and serene aspects of Korea. During the weekends, they come down to the countryside and Mrs Kim teaches them how to make ‘Dwenjang’ and ‘Gochujang’. They return back to their busy city lives but still maintain that connection because once the ingredients are fermented months later, Mrs Kim will package them and send it to them. In busy cities like Seoul, people don’t have the space or the time to ferment ‘Gochujang’ themselves but Mrs Kim offers them this connection to their history and to their land. I realised that even though Korea is industrialised and people lead busy lives, there are those who are clinging onto their rural history. Based on your journey in filming the documentary, what is the best taste of Korean food that you will never forget? In episode 2, ‘Seoul Searching’, we filmed at Gwangjang market and went to a banchan stall selling pickled and fermented side dishes. The owner gave us a bit of crab leg to try. You will see from this scene the sheer amount of banchan and pickles the one stall sells. I couldn’t even count how many there were. She had so many different varieties but there was this fermented fish kimchi, which she gave us to try after we finished filming. She explained that it was a very popular North Korean dish. The reason I choose this as the most unforgettable is perhaps not because it was the ‘best taste’ but certainly the most memorable. This fermented fish was by far the most pungent thing I’ve ever tried. The first half of the flavour tastes like aged, strong kimchi, which I’ve tasted many times and love, but the other half was this extra layer of fish and pungency that I’ve never tasted before. So it was this conflicting combination of pleasant and the familiar with the unpleasant and totally alien! How do you see the shifts of presentation on Korean food in different time and setting (such as in Seoul, New York, and London)? There are two things happening in Seoul: firstly, there is the rustic and everyday cuisine that you can get in the traditional markets and restaurants, but there is also a shift to new, fusion and international food which can be found on the street food stalls of Myeongdong and new, up and coming, modern restaurants. In London, the popularity of the street food scene has played a key role in helping to raise awareness of Korean food as people find them more accessible. There has been a definite increase in awareness in London through the street food vendors, mentions on social media and photos of Korean food on Instagram. As for New York, they are definitely ahead with Korean food. You can find several Korean food trucks doing the fusion thing on the streets, but also interesting concepts in restaurants such as Barnjoo, a ‘Korean gastro-bar’ serving rustic, farmers market produce in the form of bibimbap and jungsik style platters. I’m positive that London is on the same path and will soon catch up to the Korean food scene in New York. How do you feel when Korean food has started to be known around the world? Do you see any clashes between local and global aspects in Korean food? I strongly believe that to make Korean food more accessible to the West, you need to be open to making changes and adapting to the tastes of that locality. In my experience, the Korean food that can maintain its traditional flavours but be served in modern ways is the most successful with non-Koreans. You can stay true to Korean ingredients but you can present it in more familiar ways. For example, if you put pig’s head on your menu, no one will buy it but call it pig’s cheek and suddenly you peak people’s interests. Similarly, the majority of people won’t know what “tteokbokki” is but if you call them Korean spicy gnocchi then people will want to try it. I am very much in favour of making Korean food relevant to the Brits and I feel that’s the way we’ll really help globalise our cuisine. In five years’ time, where do you see Korean food standing in the international stage? In five years’ time, I believe Korean food will be as big as Japanese, Chinese and Thai food. Ultimately, it is because it’s delicious. Through my experience of running the KORRITO stall and talking to customers who had never tried Korean food before but now are our regulars, I honestly think it’s only a matter of time until it becomes the nation’s favourite cuisine! A few cities are way ahead of us in the game such as LA and New York. However, London is the definitely the next stop in the globalization of Korean food. What’s your plan after the documentary? You asked me why I wanted to shoot a documentary and one of the reasons when we were launching back in 2013 was to show KORRITO as a credible company and as a multi faceted brand. This helped us get the foot in the door but now with the completed project, the documentary has once again led to further opportunities for KORRITO, which we are building at the moment. Once it’s official, we will announce our plans via our usual channels! I am excited that KORRITO and Korean food is gaining more exposure. For example we were on London Live TV showing Londoners how to make kimchi fried rice for breakfast! The plan will be to continuously promote Korean food through the documentary and pursuing opportunities in order to do more than what we were doing. To you, what is Korean food? Korean food is multisensory. You see it, you taste it, you smell it and you can even hear it, for example the sizzle of the dolsot bibimbap. With all my senses engaged, it reminds me of home. It is a form of yearning for my origins. I met Jaqui Gable, an American food writer living in Seoul and she said that cooking for her is a way of staving off homesickness. So, when she’s back in the states, she will she cook Korean food. I completely identify with Jacqui. For me, Korean food is home. Thank you, Joo for taking part in this interview. Find more about KORRITO through the website, Facebook, and Twitter.